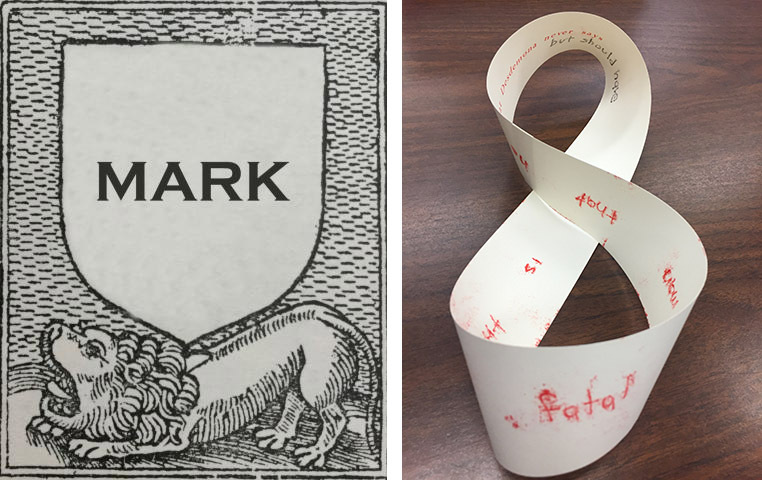 Left: Mark is an Open Educational Resource card game centered on early modern printers’ marks. Logo by Amy Chen, founder of Human(ities) Game Lab. Right: A mobius strip from Emily Martin’s artist’s book what Desdemona Never Says, Naughty Dog Press, 2014. Ms. Sheppard discussed the premise of books as inherently social objects and the promise of “doing rather than thinking” to better understand the social lives of book materials. She discussed empirical bibliographies (“the very act of turning the page can prompt reflection”), artist books (“performance rendered in print”) and card games (“adaptability, portability, collaboration”) as modalities for learning about the past as well as discussing our own “material moment” in the digital age. She showed examples such as openthresholds.org where tactility lies in the digital interface itself, opening new, oblique perspectives and modes of navigation. Her work around an open source educational resource—the card game MARK—prompted much interest and many questions. Dr. Hawley described an incredibly unique and discrete moment in the history of American education, when The New Trail was first published in the early 1940s at the Phoenix Indian School in Phoenix, AZ. It was part zine, part government publication, representing the experience of students from the many Native American Indian tribes that attended this school. She described this history of US government educational policies from 1776 to the mid 1960s and their effect on Native American Indian cultures, education practices and ideas. This publication broke the mold of typical yearbooks, presenting heritage narratives across tribal identity. 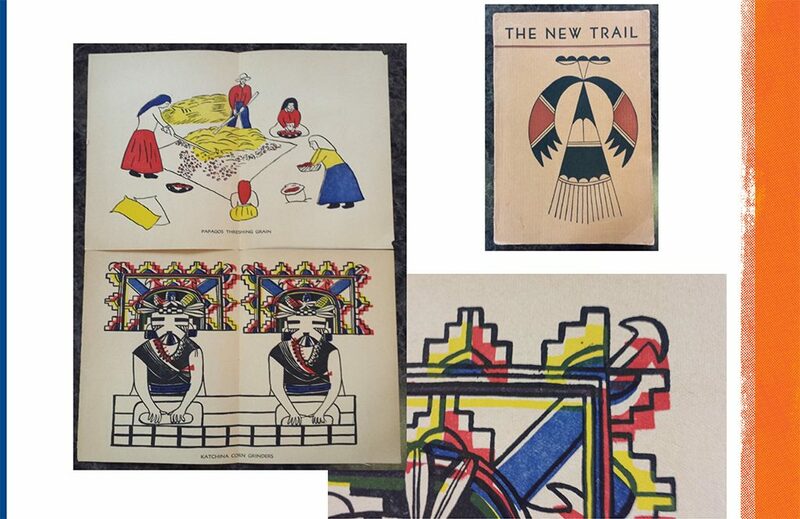 It is carefully situated as possibly the only intercultural Native American publication in the early 40s. The New Trail was produced by and for students, yet printed on tools owned by the US Government. 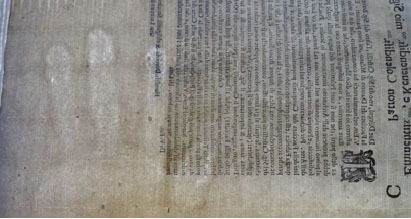 Dr. Senchyne’s paper, read by Dr. Jesse Ryan Erickson, began with an image from 1657: a sheet of paper “Per la facciatta del Duomo di Milano.” Held up to the light, the viewer can see the impression of a human hand as a watermark. Senchyne’s work goes on to consider the layers of meaning, human presence and aesthetic expression inherent in the medium. He writes, “every sheet of paper is an archive.” He cites stories such as one written by James Knox, from the perspective of a flax seed on its journey from field to rag to paper to beloved book and back to earth again. Layered here are the qualities of paper as an animate, absorptive material and the idea that conversations might be “overheard by cloth.” Senchyne writes from the perspective of a cultural historian: the social relations of an object are literally “knotted up” in the thing itself, clothbound by domestic labor, embedded in the rag rug or piece of paper. I left this talk thinking about how people experience the world in tactile ways and how facilitating these experiences can be a profound form of teaching and learning. In his first chapter of Art as Experience, “The Live Creature,” John Dewey writes, “When artistic objects are separated from both conditions of origin and operation in experience, a wall is built around them that renders almost opaque their general significance… Art is remitted to a separate realm, where it is cut off from that association with the materials and aims of every other form of human effort, undergoing, and achievement”(3). Each of these speakers illuminates this idea: how the tangible world holds a social story of people as intricately bound together and how connection between and among people (past, present and future) is one of our most compelling human impulses. Jenna Bonistalli is an artist currently pursuing an MFA in Sculpture at the University of Iowa concurrent with a Graduate Certificate at The Center for the Book.